This challenge is inspired by Blink the CAPS LOCK by zeppelin. 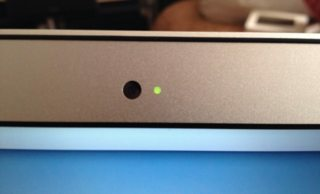 Most webcams feature a small integrated LED light, indicating if the webcam is in use, as controlled by a hardware mechanism to prevent spying. Wait for 0.5 (±0.1) seconds. Please include a GIF or video of the webcam blinking, if possible. If an answer doesn't have the GIF, please add a GIF of the program running. Your program must loop unless halted by the user. Your LED can start either on or off; whichever is more beneficial can be used. If your LED has a turning-off delay, then it doesn't have to be taken into account, unless if you want to provide an additional version. See this comment and its answer for more information. This is code-golf, which means the shortest answer in bytes wins. Creates an infinite while loop and each time through the loop, a webcam object is initialized (turns on the webcam), the script is paused for 0.5 seconds using pause, and then the webcam object is deleted (turning the webcam off). During my testing, I saw a delay between the camera being activated and the LED turning on, so the timing may not be perfect. It also must run on an https:// page. Sorry about the absolutely terrible video. My LED has a slight turning-on delay, it is very faint, and the GIF is 18 MB. Not the answer you're looking for? Browse other questions tagged code-golf hardware or ask your own question. All Light All Light All Light!